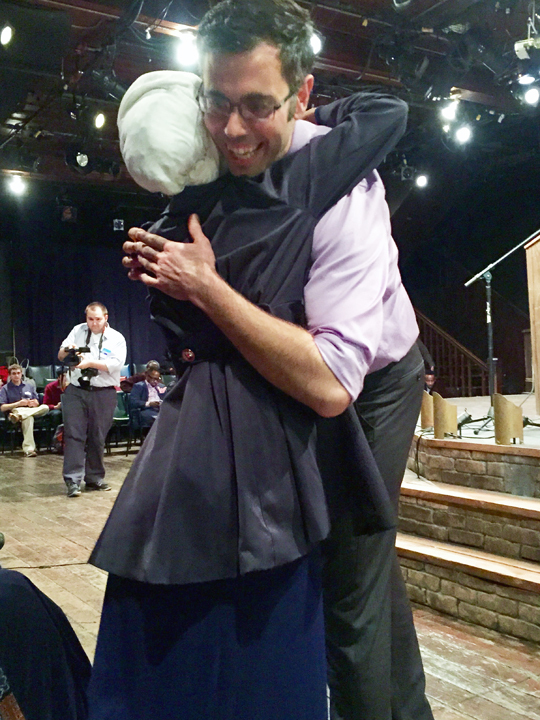 Those ‘old ideas’ were an indirect jab at incumbent, Phyllis Kahn, who has represented the largely Democrat district which covers Cedar-Riverside, Prospect Park, Marcy Holmes, Nicollet Island, West Bank, Seward, and Como for 43 years now. Khan in her last re-election was thought to have faced her toughest challenge for the DFL nomination yet in then candidate Mohamud Noor. Securing this year’s nomination for Kahn may present an even bigger challenge; facing up not only to Noor again, but Omar also who has secured the support of key figures and constituents in the district. Omar who had previously supported Noor’s campaign, and counts Khan as instrumental in “paving the way for women to partake politically and in activism” presents a third choice for the DFL ticket, in a district whose last election cycle was marked by violence and allegations of both threats and fraud. The campaign kickoff felt jovial and tight knit; with many shaking hands and exchanging hugs as they poured into the theater. A mix of world music piped in overhead as attendees mingled with or stopped Omar for a picture. Speaking with Lula Salah before she took to the stage as the first of 3 live performers of the night, I asked her what she thought of Omar’s campaign. That cross-section includes a growing East African community that finds its heart in the Cedar-Riverside community, students from the University of Minnesota who are becoming increasingly engaged in politics, long time community residents, and activists who have made their home in the district. Omar’s political appeal appears to be the ability not only to rally the East African community behind her, but all the other community members who feel left out of the process, or who find that their needs aren’t being met. One such community member is Joelle Stangler who also happens to be the University of Minnesota’s student government president. Also known as the Minnesota Student Association, the student government of the state’s largest campus has come out in full support of Omar for reasons that Stangler shared with the crowd as she took to the stage Tuesday evening. Stangler told the gathered crowd that within the current legislature the “Student voice isn’t heard or being championed, but I don’t feel that way when I talk to Ilhan. 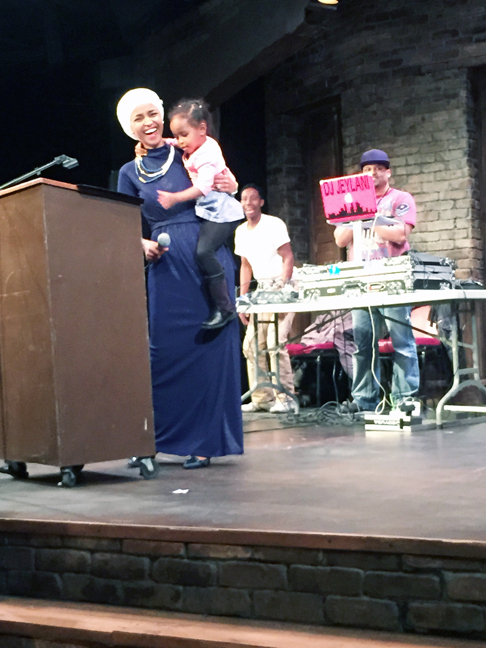 I see her interest in our interests.” Omar herself confirmed these shared interests in education in her closing speech where she touched on rising college debt and the need to make education affordable and accessible as a means to close Minnesota’s education gap, one of the largest in the nation. In a heartwarming speech that saw Omar introduced on stage by her son Adnan, while her youngest daughter clung to her momentarily before being whisked off stage, Omar was at her best. She gave thanks to the many gathered, her family and friends, former boss, council member Andrew Johnson (who spoke briefly before leaving for another engagement), and Councilwoman Alondra Cano, among others. In her speech, Omar painted a vivid picture of her history and the experiences that had influenced her politics; from her grandfather who had inspired her love for politics at a young age, and began taking her to caucuses at age 14 as his translator. 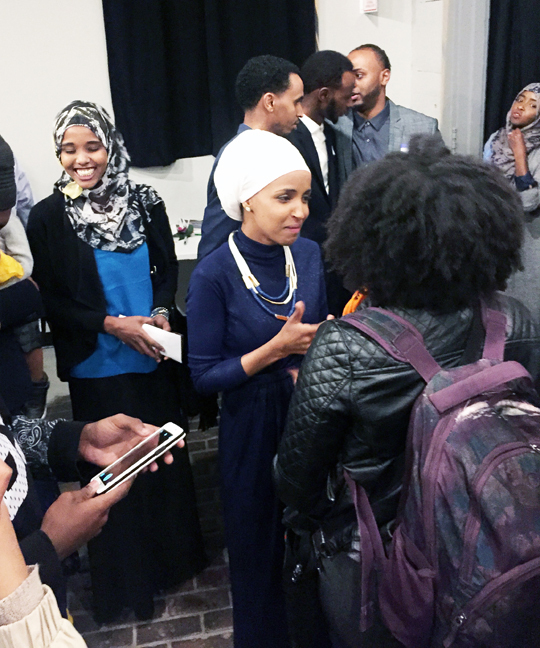 She spoke of her first few jobs beginning at 16, one of which she worked alongside her father, a single parent who had moved his family to Minnesota from Mogadishu. She shared how her experience visiting Somalia in 2011, during the worst famine in decades in the Horn of Africa, had influenced her views on environmental issues as she worked desperately to bring food to families who were in ruin. Omar also talked about her days working in the City of Minneapolis as a policy aide (to Councilman Johnson) and the policies she had pushed to better her community. One of the change of policies she worked on allowed restaurants in the city of Minneapolis to have later hours during the holy month of Ramadan. With each personal experience, Omar connected the audience to her campaign issues; improved working conditions and wages for workers, investing in education to tackle the education gap, criminal justice reform including restoring voting rights, and environmental justice. But Omar who is running in a largely Democratic and liberal district does not just stand out for her stances on these issues. In an effort to further distinguish herself as not just a liberal politician running in a largely liberal district, Omar asked the crowd what the difference was between a liberal and a progressive. If elected, Omar would be the first Muslim American woman and first Eastern Africa woman elected to statewide office in the United Sates. Kari, formerly of Minneapolis is now based in Nairobi. She is a writer, born and raised in Kenya, and a true global citizen. When not writing for Mshale, she is actively pursuing justice and equality for all through her writing and activism.